Another season beckons, cars (most) have been launched and testing is underway so what should you be aware of or on the lookout for this season? Last years aesthetic abominations have been cast out and fresh more prescriptive regulations put in place, but with such emphasis on aerodynamic performance there are bound to be a few solutions on offer. The most obvious route is that taken by Williams, a simple 'thumb' extension but there are still a multitude of variations all of which I'm sure we'll see as each team have built their own concept. The regulations ask for a cross section of 9000mm2 50mm behind the nose tip, with a maximum width of 140mm starting at 135mm from the reference plane, 100mm behind this a 20000mm2 cross section must be formed at a width no greater than 330mm, whilst the nose itself must be no shorter than 850mm. The front wings neutral section is the most important aspect of the nose design as the shaping, placement and length of the tip will have an affect on how it performs, and with each team designing theirs differently advantages however small may be gleened. As we know the manufacturers are now free to use their 32 token allocation throughout the 2015 season, rather than having to homologate at the end of February. It's a Peter robs Paul scenario whereby those behind want to spend their tokens in order to make up the deficeit early on, knowing that Mercedes had an unassailable lead in 2014 and may only extend it going forward. Taking time to spend the tokens also means waiting several races to implement them, with only 4 PU's per driver this season means waiting 4-5 rounds before the driver can get his hands on the improved PU. Word on the street is that Mercedes are sticking relatively close to their original schedule, spending the majority of their tokens when the cars are unleashed in Melbourne. Renault and Ferrari will try to spend as few tokens as possible, get their bearings and have something better ready for Barcelona/Monaco, any sooner and they'll be out of sync in usage terms putting them at risk of penalties come the end of the season. Honda meanwhile will have the average leftover from everyone elses token spend in Melbourne to help with their development. Whilst on the topic of the powerunits, something of note for 2015 is the availability of variable inlet trumpets, this is something the teams/manufacturers have known about since the inception of the new PU regulations (was written into the 2014 regulations and I've been talking about it for long enough). Whilst some have suggested that Honda's return to F1 should be met with them receiving the 32 development token allocation everyone else has, this is the exact reason they cannot. No doubt about it the RA615H will feature variable inlet trumpets meaning that if Honda had homologated a 2014 powerunit they'd have already spent tokens changing from a standard intake. Variable inlet trumpets aren't something new in F1, but the last time we saw them was during the V10 era, their return however will make a difference in terms of efficiency and have some desirable side effects that perhaps won't even be fully exploited initially. That's because of the technology being used is still in its infancy, the MGU-H's role in 2014 for instance wasn't properly asserted by the mainstream media as they simply don't have the capacity to explain the ERS in a concise manner. Variable inlet trumpets for the most part are used as a way of smoothing the powerband, whilst increasing the potential at lower and higher rpm than with their static counterparts, something that in part the MGU-H was doing when driving the turbocharger in 2014 (infill). 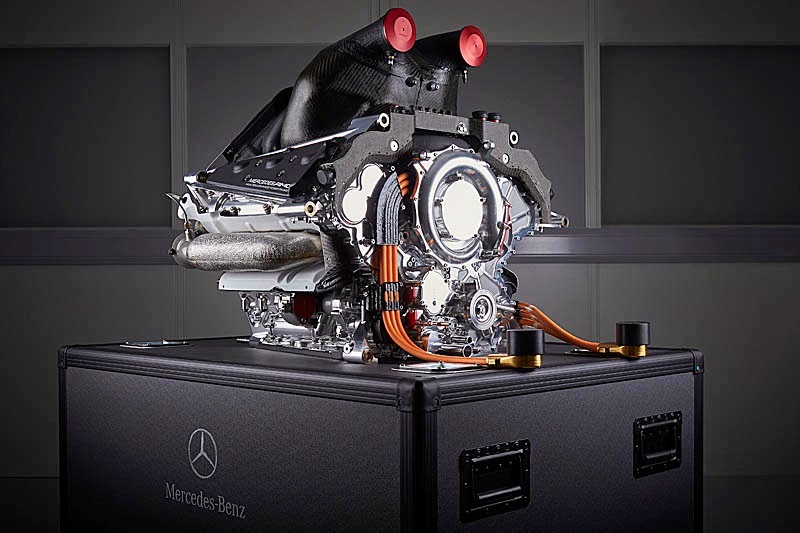 Adding variable inlet trumpets means that the energy expended by the the MGU-H may be lessened, meaning there may be more energy availability to the MGU-K to propel the car. 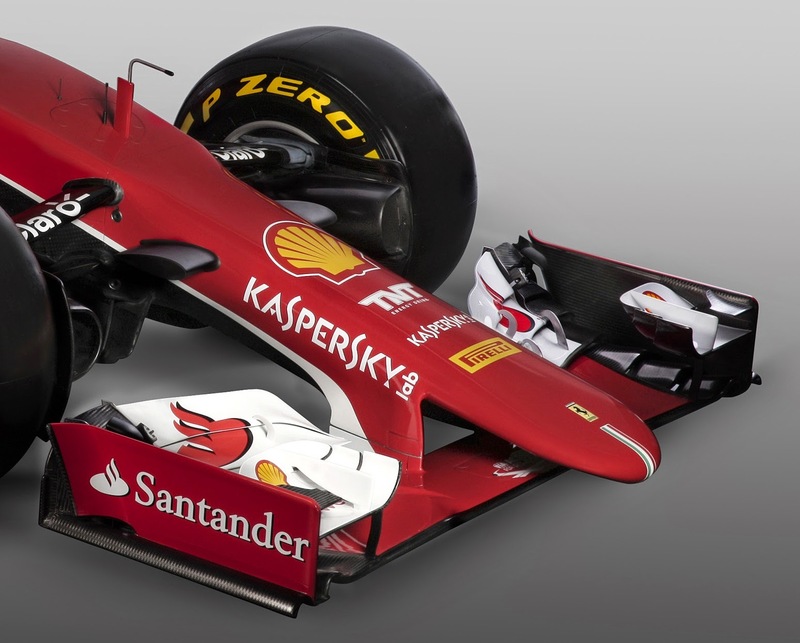 As with all things in F1 the manufacturers will all look at this potential differently and come up with their own designs based on strategy simulations. I'm not for once suggesting that variable inlet trumpets are suddenly going to change the powerunit pecking order, but it is certainly something that has a domino effect on other areas of the powerunit (its ramifications on cylinder deactivation and the like is what interests me). The mainstream media will have you believe that titanium skids have been re-introduced for their romantic effect, creating sparks when the car bottoms out. They will do that, but that is not why they've been mandated. The teams are always pushing in directions that the FIA don't want them to and that's because they can gain performance, one such way is protecting the skid block from wear, which would ordinarily mean a DSQ for a driver past 1mm wear on the plank in post session scrutineering. The teams therefore had taken to using Tungsten rather than titanium in recent years, allowing the car to bottom out (front end of the skid block/plank) without such a high wear rate. Had these skids been made of Titanium they would have worn more abrubtly (causing the pretty sparks for the superficial fans) and risking more wear to the skid block. The FIA assume that by mandating the use of Titanium it will force the teams into less radical ride heights / rake, but most of the top teams have seemingly already found ways around this over the last few seasons with multi sectional splitters (read the upcoming 2nd issue of our Mercedes W05 eMagazine for more insight) and flexible splitter stays.